Sometimes the best transformations are the simplest ones. Recently, Brett and I found ourselves in search of the perfect coastal coffee table for our living room. I wanted something round, on casters and with plenty of storage, so I went straight to Craigslist to find “good bones”. I came across a beautiful, quality table with perfect bones! The table’s dark finish was in decent shape, but it definitely had some imperfections…plus, I’m a sucker for white EVERYTHING. This coffee table didn’t start out too bad, I’ve definitely had worse pieces, but to fit in with our space it definitely needed a coastal-inspired facelift. I’m always a fan of painting large pieces in neutral colors (I like to save bright colors for smaller accents), so it wasn’t a big surprise when I chose a crisp white for my new table. 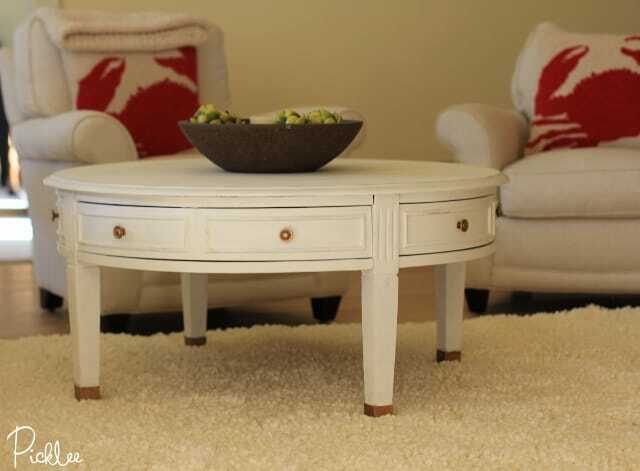 I gave my coffee table two coats of simply white chalk + clay paint, waiting about an hour between coats. Since chalk paints don’t require prep work (besides basic cleaning) before painting, no priming or sanding was necessary, despite the heavy gloss coat on my table =) . After both coats were dry, I used a damp cloth to lightly rub paint off edges and detail work. This gave the table a classically distressed coastal feel. 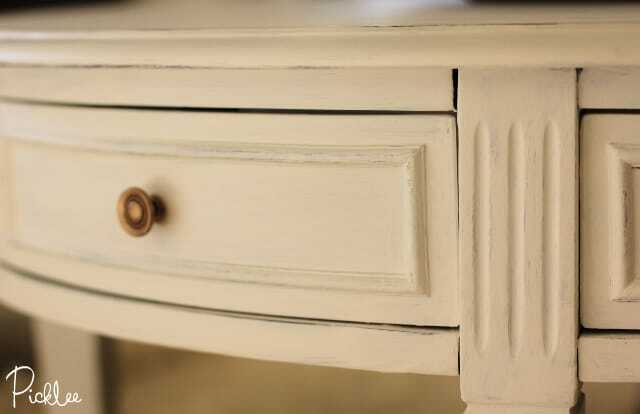 Once the table was perfectly distressed, I buffed on a coat of clear wax to seal the paint. 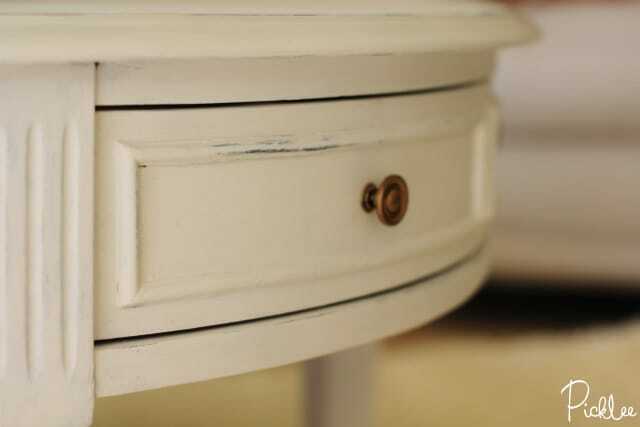 Finally, I transformed the table’s dull hardware using Antique Gold Rub n’ Buff. 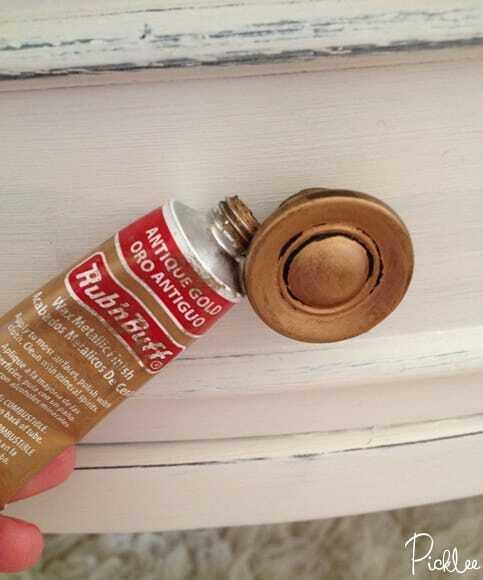 I absolutely love the classic look of white and gold, and this amazing wax paste works instantly as you buff it on to hardware. That’s it! A bit of paint and couple hours was all it took to flip this dated Craigslist find into a classic coastal beauty! 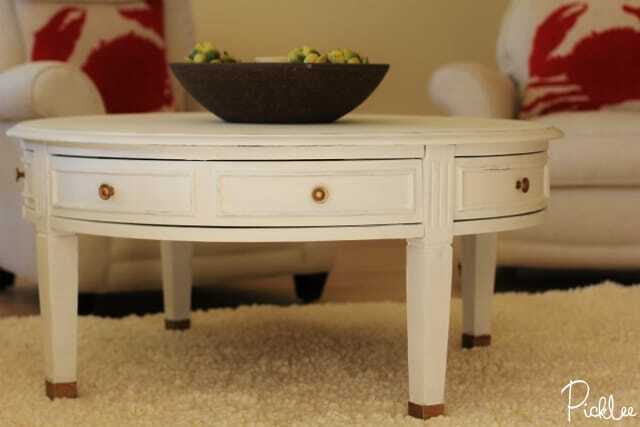 Hope you enjoyed this simple coffee table flip! 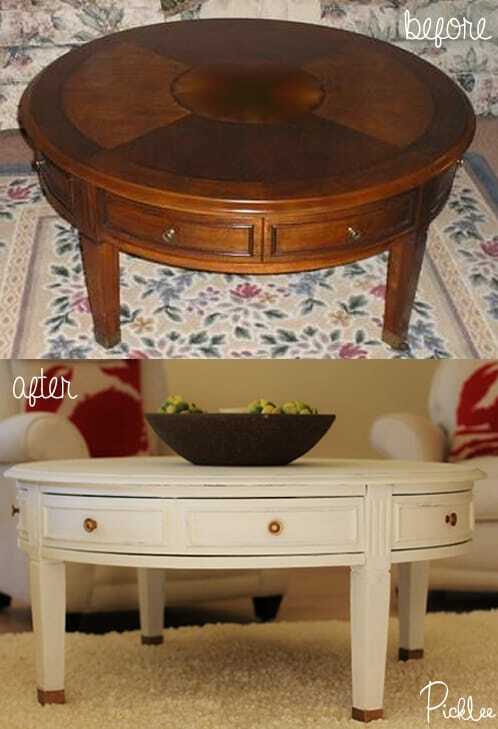 Find more before & after furniture flips here! Positively LOVE this transformation!!! Bookmarking for sure! 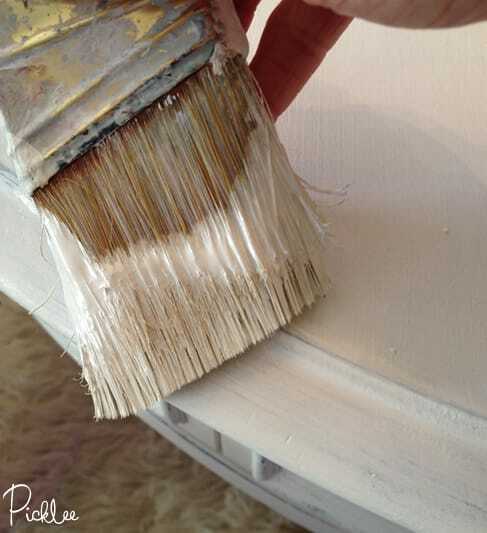 Omygosh I just had to leave this comment really quick… I’m about to paint my old round coffee table and I Google “coastal round coffee tables” for paint color ideas (leaning more towards white from the get go) and here I find your post. 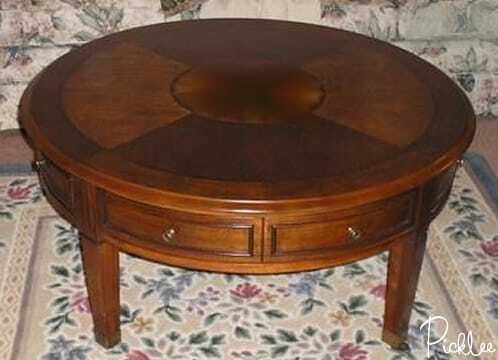 WITH THE SAME COFFEE TABLE. LOL! What an amazing coincidence and I just want to thank you because now I see how awesome my coffee table will be in white. Great post, thank you! I have same coffee table but mine had waves in top.I scraped the fake wood and used dry wall mud.Sanded.